Beautiful Pair of glove 1 pair is Aqua and 1 pair is Black. These are knit gloves so will fit most hands. 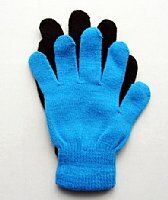 Perfect for a gift or if you have a puppet team they can all wear matching gloves. They also can be pratice glove for you hand mime team. We have 6 colors in this group: Yellow, Pink, Orange,Green, Aqua, and Purple. You may buy all 6 colors as a set at a discount price.